The Manchester Wastewater Treatment Plant has done it again, earning a perfect performance award for compliance with its state water-quality permit. The Manchester plant, operated by Kitsap County, remains ahead of the pack, being the only sewage-treatment plant in Washington state with a perfect score since the Department of Ecology launched its Outstanding Performance Awards program in 1995. That’s 23 years. Port Townsend Wastewater Treatment Plant has maintained perfect performance for 20 years, and six plants have reached that level for 10 consecutive years. For this year alone, 111 treatment plants achieved perfect scores — about a third of all the plants in the state. In Kitsap County, stormwater has been a major issue — and the subject of ongoing newspaper stories — for a very long time. As a local reporter working for the Kitsap Sun, I followed the prolonged struggle among engineers, developers, planners and environmentalists to approve new rules for reducing toxic runoff washing into Puget Sound. After the legal battles were over, local governments were called on to update their stormwater codes, and many key provisions went into effect last year. It was with some surprise that I read a new report called “Nature’s Scorecard,” which reveals that more than half of the 81 cities and counties around Puget Sound have failed to follow through in a meaningful way to encourage low-impact development, which is required by state rules. Low-impact development, or LID, involves techniques that filter rainwater into the ground as close to the source as possible. According to the report, 15 percent of the local governments failed to update their codes, and an additional 38 percent made only minor changes. 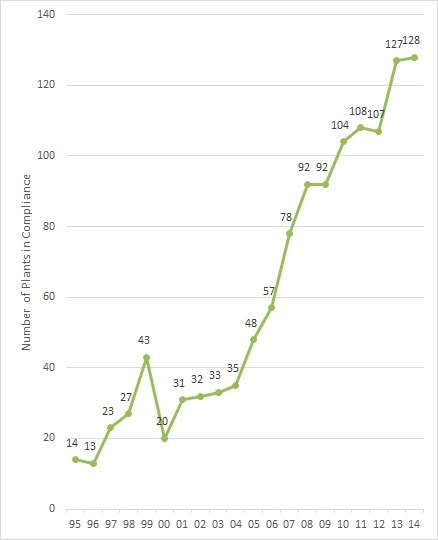 Out of 81 local governments, 20 were forced to file a “notice of noncompliance” admitting they had not met the new standards. 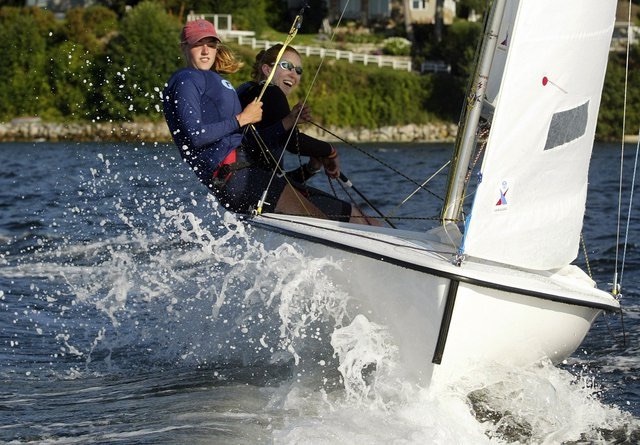 The scorecard is a joint effort by two environmental groups involved in water quality, Washington Environmental Council and Puget Soundkeeper Alliance. It was nice to know that the authors of the report contacted local officials in advance where deficiencies were noted. Some officials offered explanations, and others moved quickly to fix the deficiencies, according to Mindy Roberts of WEC. Mindy told me that she hopes the scorecard and discussions with local officials will result in LID improvements without going to court. The scorecard also calls out municipalities that have done exceptionally well on the LID front. Named as “green star leaders” for going beyond the minimal standards are Kitsap County and the cities of Lacey, Oak Harbor, Olympia, Port Orchard, Renton, Seattle and Tacoma. See the news release on WEC’s website. The softer approach also paid off in Fife, where stormwater officials apparently were not aware of the state requirement to make LID the primary method of stormwater management, Mindy said. After city officials were contacted, they jumped into action and now have a code that will reduce stormwater pollution. Stormwater officials in Mountlake Terrace were on schedule to meet the state mandate, Mindy said. But the City Council, under pressure from developers, failed to pass the code language when it was presented to them. Now city officials are again working to come into compliance, she noted. 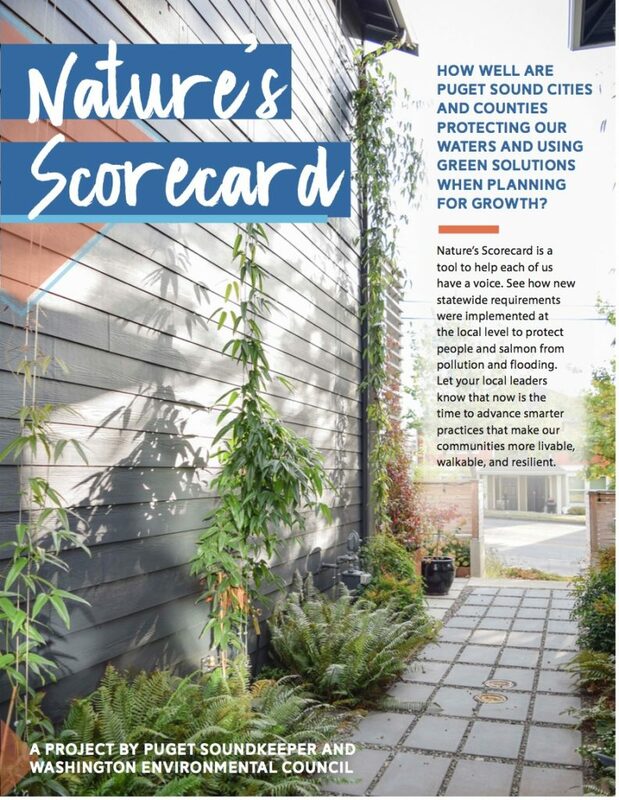 The website for “Nature’s Scorecard” includes information about the impacts of stormwater, the need for LID regulations and the status of various cities and counties. Scores in the report come from compliance with five key LID strategies: reducing impervious surfaces, protecting native vegetation and soils, supporting pervious pavement, planting native vegetation, and protecting natural buffers along streams, wetlands and shorelines. Puget Sound residents are encouraged to review the report’s findings and support their elected officials in the implementation of LID to protect Puget Sound. Contact information for city and county stormwater officials is provided for each listed municipality. One of the reasons that Kitsap County is a leader in stormwater management is the support from residents of unincorporated areas. Each property owner pays an annual fee to monitor water quality, assess pollution problems, develop appropriate solutions and construct regional stormwater systems in already-developed areas. Anyone can review the current five-year stormwater capital plan (PDF 1 mb). The Kitsap County commissioners recently approved new stormwater fees for the coming years. It was interesting to hear the testimony of supporters at the meeting. Check out the video (above), beginning at 25:09 minutes. A fact sheet on the fees (PDF 1.6 mb) can be found on the county’s website. Like Kitsap County, the city of Auburn has fully embraced stormwater management to address flooding and reduce pollution. Information, including an in-depth comprehensive storm drainage plan, can be found on the city’s Storm Drainage website. At the national level, Kitsap County and Auburn received awards last year from the Water Environment Federation Stormwater Institute, which promotes innovative stormwater solutions. They were among six award winners nationwide for both large and small municipalities that go beyond regulations. Auburn was recognized for its stormwater innovation, while Kitsap was recognized for its management. See the news release from WEF. “What makes stormwater toxic?”: The dangers of road runoff and possible solutions are examined in an in-depth story by reporter Eric Wagner. The piece was published Dec. 4 in the Encyclopedia of Puget Sound. U.S. Government Accountability Office (PDF 4.7 mb): In a survey of 31 municipalities, the GAO found that green infrastructure — another term for LID — was more challenging than traditional pipes and ponds. GAO learned that collaboration among nearby governments is important and should be supported through documented agreements. “Are you planning for LID?”: Association of Washington Cities provides information resources and videos. Building Industry Association of Washington: BIAW offers information on specific LID techniques, manuals and guidelines, technical articles and reports, and links to government requirements. Citing pollution problems in Puget Sound, an environmental group is asking the Environmental Protection Agency to revoke Washington state’s authority to enforce the federal Clean Water Act. Northwest Environmental Advocates, based in Portland, says a review of 103 discharge permits issued by the Washington Department of Ecology shows a failure to control nitrogen pollution. Excess nitrogen reduces oxygen levels in the water and triggers algae blooms, resulting in serious problems in Puget Sound, according to a petition submitted to the EPA. “Ecology determined that over 80 percent of the human sources of nitrogen in Puget Sound comes from cities and towns, but it continues to issue discharge permits as if it were completely ignorant of these facts,” Nina Bell, the group’s executive director, said in a news release. One of the goals established by the Puget Sound Partnership is to improve freshwater quality in 30 streams throughout the region, as measured by the Benthic Index of Biotic Integrity, or B-IBI. 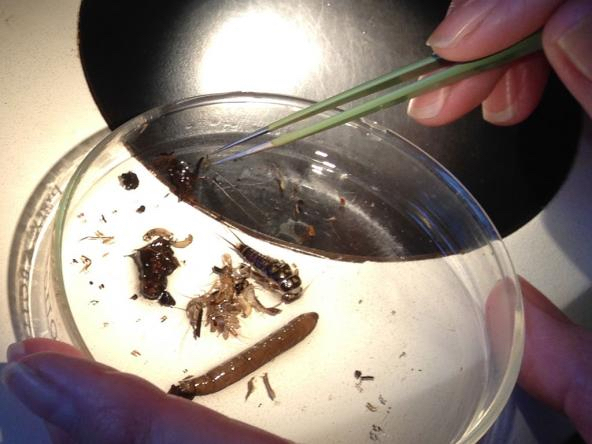 Because benthic invertebrates have evolved over time with salmon and other fish, many of these important “bugs” are primary prey for the fish that we value highly. Said another way, “healthy” streams — as measured by B-IBI — tend to be those that are not only cool and clean but also very good habitats for salmon. Overall, the Kitsap Peninsula is expected to have enough water for people and fish for many years into the future, as long as the water is managed well, according to a groundwater model developed by the U.S. Geological Survey. The model offers reassuring findings for residents of the Kitsap Peninsula. It is also encouraging to see local water, sewer and public works officials working together to plan for infiltrating stormwater along with recycling wastewater for irrigation. Those efforts will not only protect the peninsula’s water resources but will save money for water customers. The most impressive part of the groundwater model is the mapping of geology across the entire peninsula, based on more than 2,100 well-driller logs that describe the type of soil at various depths. Putting that information together provides a three-dimensional picture of the underground structure, including sand and gravel deposits, which contain water, along with layers of clay and compressed soils, which slow down the water movement. By monitoring water levels in 66 wells over time and accounting for rainfall and groundwater withdrawals, the computer model provides a dynamic picture of what happens under various conditions. The model can be used to predict what will happen to Kitsap’s aquifers under various rainfall scenarios, including long periods of drought. The model also can predict what will happen to streamflows under various rainfall scenarios. The Kitsap Peninsula has no mountain snowpack to supply the streams with water during dry summer months, so the water must come from slow-moving underground supplies. Now that the model is complete, it can be run for almost any pattern of rainfall or drought that one wishes to dream up. For example, running the model with average rainfall and no pumping at all (close to a predevelopment condition) would bring the average groundwater level up about 25 feet — although groundwater levels in some places would be raised more than in other places. Streamsflows under the no-pumping scenario would be an average of about 2 percent higher — although this would be difficult to measure with current instruments. Nobody would really notice the difference. If pumping across the peninsula were increased by 15 percent, there would not be much difference in aquifers near the surface and only a two- or three-foot drop in aquifers around sea level. Streamflows would go down by a fraction of a percent but not enough to notice. Decreasing groundwater recharge by 15 percent, such as paving over the landscape with new roads, houses and parking lots, would have a greater effect on streamflows. Again, not all areas on the peninsula will see the same effects. The model can be used to zero in on specific streams and their watersheds — although the smaller the area of study, the less accurate the prediction is likely to be. Bob Hunter, manager of Kitsap Public Utility District, said the model can be used to predict the effects that new wells would have on streamflows as the population grows. The model could advise managers whether it would be advisable to pump certain wells at certain times of the year and hold back at other times. 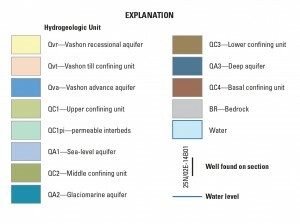 Kathleen Cahall, water resources manager for the city of Bremerton, said the model can also be used to make sure aquifer-recharge areas are protected and that industrial facilities that store large quantities of chemicals are not located where a spill could contaminate a major underground water supply. Morgan Johnson, general manager of Silverdale Water District, said he would like to use the model to predict what will happen when highly treated effluent from the Central Kitsap Wastewater Treatment Plant is used to irrigate ball fields and other areas in Central Kitsap. 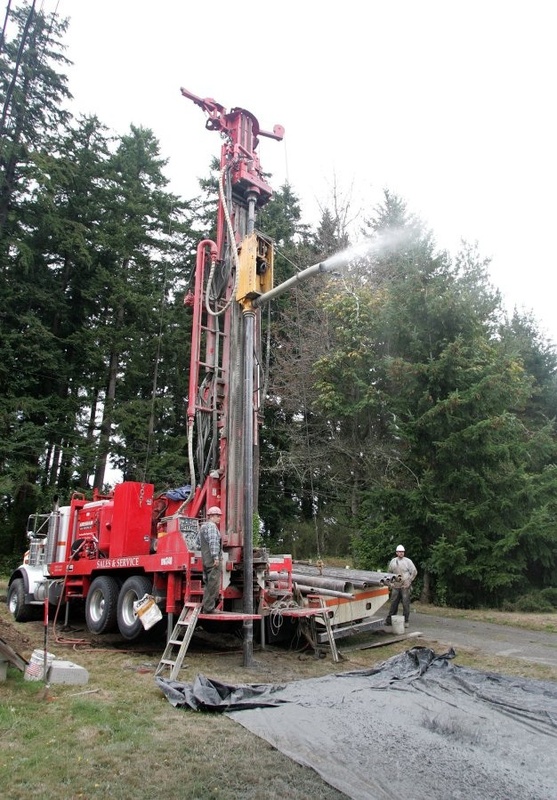 Efforts between the water districts and Kitsap County might lead to greater infiltration of water and greater groundwater supplies to be pumped from existing wells throughout Central Kitsap. 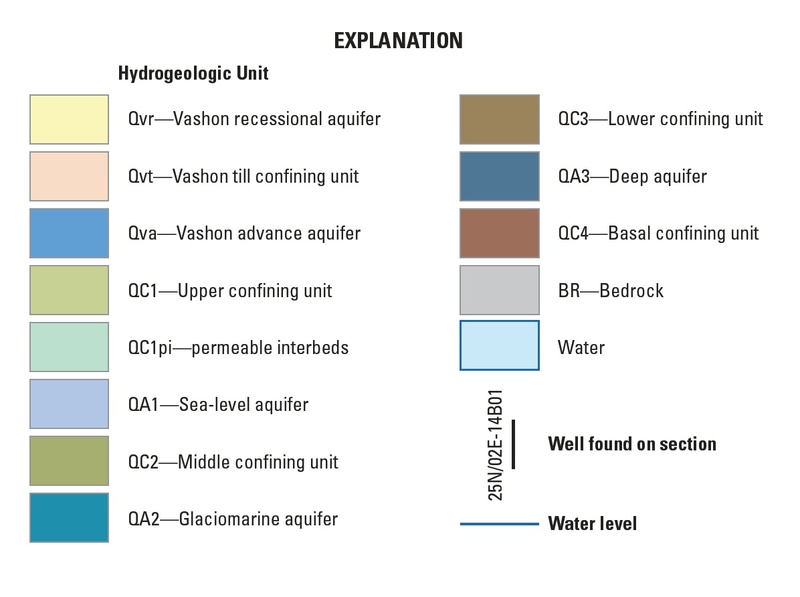 The model was built on background information, which can be found in the report “Hydrogeologic Framework, Groundwater Movement, and Water Budget of the Kitsap Peninsula” (PDF 49.8 mb). The USGS provided half the costs for the study. The other half was shared among Kitsap PUD; Silverdale Water District; West Sound Utility District; North Perry Water District; Manchester Water District; the cities of Bremerton, Port Orchard, Poulsbo and Gig Harbor; Washington Water, a private utility; and the Suquamish and Port Gamble S’Klallam tribes. Four years ago, I wrote an “Amusing Monday” blog post I called “Toilet songs for the holidays.” This year, I was unsuccessful in finding some good water-related songs for the Christmas season, so I thought a replay might be in order. The following, from Dec. 19, 2011, features an amusing song called “O Christmas Grease” by Steve Anderson. Knowing more than a few sewer operators in my day, I can tell you that their leading pet peeve is all the stuff that people dump down their toilets and drains. I’ll never forget the courtroom description of a giant “rag ball” — some 30 feet long — found in Bremerton’s sewer. Rag balls are the accumulation of diapers, tampons and baby wipes that get flushed down the toilet and become caught somewhere in the sewer lines. Bremerton’s famous rag ball became wrapped up in courtroom testimony during a lawsuit against a sewer contractor hired by the city to run the operation. 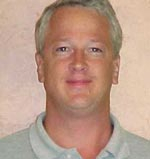 For details, check out my story from April of 1998. What I really wanted to share with you this week is a song called “O Christmas Grease” by Steve Anderson, a water resources analyst at Clean Water Services. This is the agency that manages wastewater and stormwater in a 12-city region west of Portland, Ore.
Steve often writes music and performs in a band when he’s not working at the utility. He told me that he started writing original songs as well as parodies of existing tunes to entertain his fellow water experts at conferences. Last week, for example, he showed up at a conference to help educators decide whether humor is useful in educating people about wastewater issues. Steve says the public-education folks at Clean Water Services tolerates his songs, but they do not fully embrace his activities. His first song — a parody about the low levels of drugs that make it through the treatment process — got him into a little hot water with some folks in the business. “Dope in the Water” is sung to the tune of the Deep Purple original. Steve has not released these songs to the public, though he readily shares them with friends and anyone who will listen. I must thank Gayle Leonard, who writes a blog called “Thirsty in Suburbia,” for bringing Steve’s songs out into the light and putting me in touch with this creative force in the sewer world. Identifying and eliminating sources of water pollution — a process involving “chemical action plans” — is a common-sense idea that never faced much opposition among legislators. But the Legislature’s failure to act on the idea this year cut the legs out from under Gov. Jay Inslee’s anti-pollution plan, which included updated water-quality standards along with authority to study and ban harmful chemicals when alternatives are available. Although chemical action plans make a lot of sense, the idea of coupling such planning to water-quality standards never quite gelled. 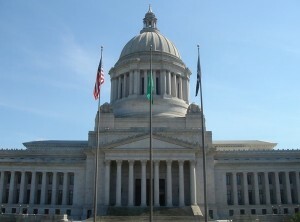 Inslee argued that water-quality standards alone would not solve the pollution problem, because the standards address only a limited number of chemicals. Furthermore, while the water-quality standards define an acceptable level of pollution for a body of water, they are limited in their regulatory control. The standards generally limit discharges only from industrial processes and sewage-treatment plants. In today’s world, stormwater delivers most of the pollution. Legal limits for stormwater discharges are nonexistent, except in rare cases where a toxic-cleanup plan has been established. Environmentalists and tribal leaders were disappointed with the governor’s proposed water-quality standards. They believed he should be calling for much more stringent standards. 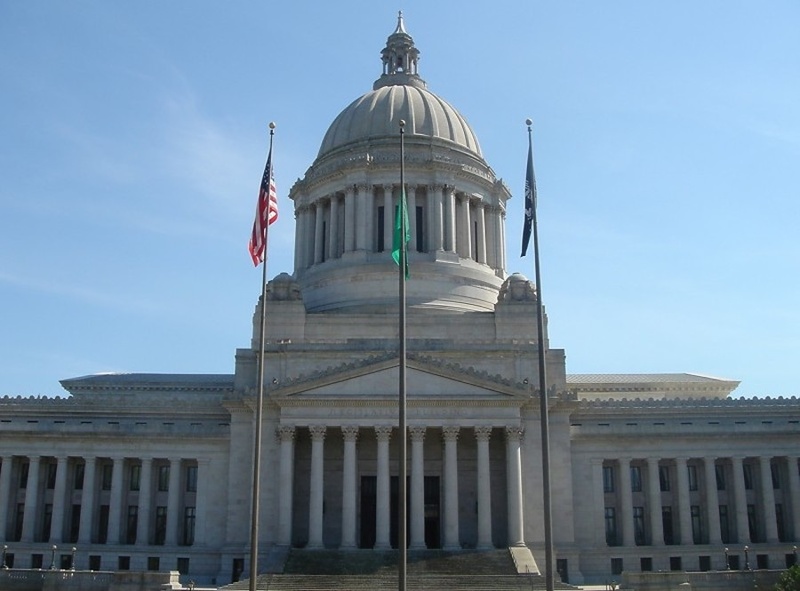 While most people liked the idea of an ongoing program of chemical action planning, the governor received limited support for his legislation, House Bill 1472, among environmental and tribal communities. We can’t forget that Inslee had publicly stated that if the Legislature failed to act on his full pollution-cleanup program, he would revisit the water-quality standards — presumably to make them stronger. So the governor kind of boxed himself in, and that’s where we stand today. Republican legislators acknowledged the value of chemical action plans. Their concerns seemed to center around a distrust of the Department of Ecology, reflecting the views of the chemical industry and others who could find themselves under greater regulatory control. The House stripped out a provision in the bill that would allow Ecology to ban chemicals without legislative approval. And the key committee in the Senate — the Energy, Environment and Telecommunications Committee — went further by limiting Ecology’s ability to study safer chemicals when a ban is under consideration. The governor ultimately shifted his support away from the bill that emerged from the committee, as I described in a story I wrote in April for InvestigateWest. The bill never made it to the floor of the Senate, and it ultimately died, along with funding for a wider range of chemical action plans. “Not only did we not get additional policy help, but we also didn’t get funding to implement the chemical action plans that were already done,” noted Rob Duff, the governor’s environmental policy adviser. In all, about $3.8 million for toxic cleanup efforts was cancelled along with the legislation. Plans have been developed to reduce toxic releases of five classes of persistent, bioaccumulative toxics, or PBTs, including polychlorinated biphenyls and mercury. But carrying through on cleanup ideas spelled out in those plans has been slow without targeted funding, and many toxic chemicals of concern, such as pharmaceuticals, are not considered PBTs. Educational programs and voluntary efforts by industry remain in play, pending a further try at legislation next session. Meanwhile, the governor will review the proposed water quality standards, according to Duff. The governor’s proposed water-quality standards have gone through public hearings and must be approved by Aug. 3, or else the process must start over. Meanwhile, the Environmental Protection Agency is developing its own water-quality rule, which could impose stronger standards upon the state. Water-quality standards, which are a concentration of chemicals in the water, are based on a formula that accounts for how each chemical is assimilated through the food web and into the human body. One factor involves how much contaminated fish a person is likely to eat. For years, states across the country have used the same fish-consumption rate of 6.5 grams a day, which is less than a quarter of an ounce. This number was long recognized as grossly underestimating the amount of fish that people eat, especially for Northwest residents and even more so for Native Americans who generally consume large quantities of fish. If adopted, the new water-quality standards would raise the daily fish-consumption rate to 175 grams, or about 6 ounces. If all other factors stayed the same, the new fish consumption rate would raise the safety factor by 27 times. But, as the update moved along, several other factors were amended as well. Inslee’s proposal was to raise the allowable risk of getting cancer after a lifetime of eating 175 grams of fish each day. The proposal was to increase the risk factor from one case of cancer in a million people to one case among 100,000 people. 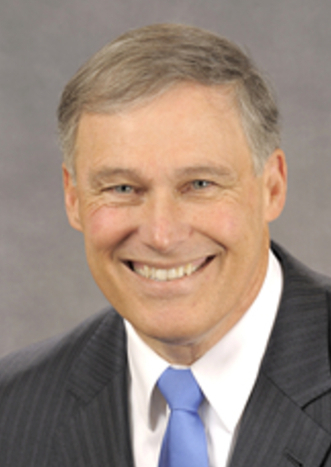 Inslee included a “no-backsliding” provision, so that the allowable concentration of chemicals would not be increased, no matter what the formula came up with. Environmental advocates and tribal leaders cried foul over the cancer risk, and Dennis McLerran, regional administrator for the EPA, said he did not want the cancer risk to be increased for any state under his authority. 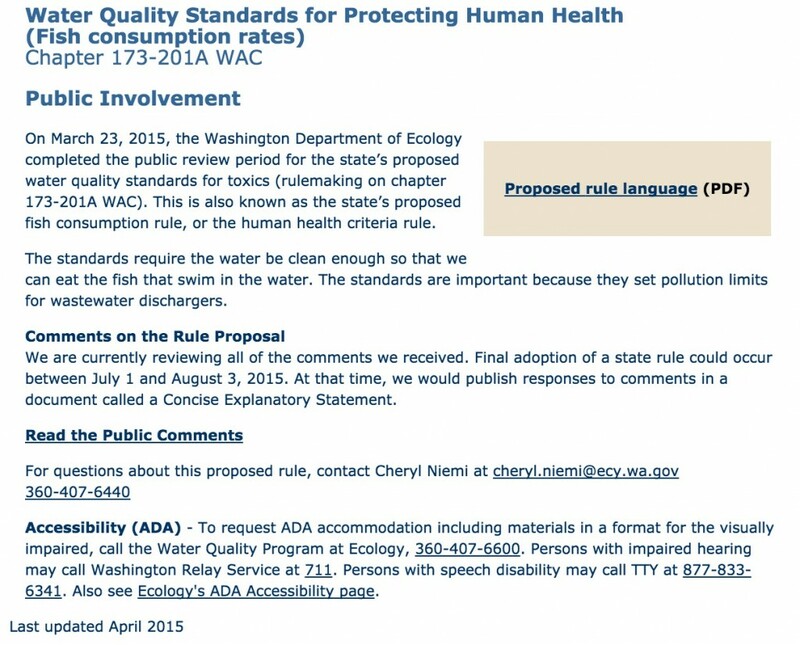 The EPA expects to have its proposed standards for Washington state ready this fall, possibly November. EPA officials will review the state’s proposal when it is final, but that won’t stop the agency from completing its work, according to a written statement from the EPA regional office. 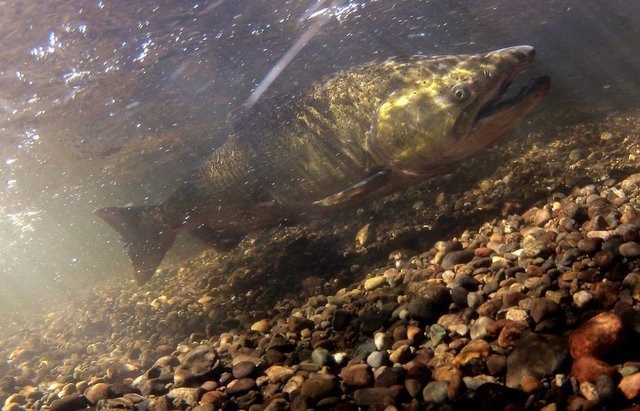 “We continue to work closely with Governor Inslee’s office and the Washington Department of Ecology to see water quality standards adopted and implemented that protect all residents of the state, as well as tribal members, who regularly and often consume fish as part of a healthy diet,” according to the statement. Industry officials and sewage-treatment-plant operators have argued that the technology does not exist to meet some of the water-quality standards that would result from a cancer-risk rate of one in a million if the other factors stayed the same. PCBs is one example of a pollutant difficult to control. Besides, they argue, stormwater — not their facilities — is the primary source of PCBs in most cases. That’s why eliminating the original sources of PCBs is so important. McLerran, who seems to support the more stringent standards, has mentioned that facilities can apply for variances, relaxed compliance schedules or other “implementation tools,” to get around strict numerical standards impossible to meet with today’s technology. Environmental groups are calling on the governor to tighten up the proposed water-quality standards, rather than let them go into effect, given the Legislature’s failure to approve his overall plan. “Gov. Inslee must do everything in his power to protect the most vulnerable — babies and children — from the devastating health effects of potent neurotoxins like mercury and carcinogens like PCBs,” stated Chris Wilke, executive director for Puget Soundkeeper. Others maintain that the governor has been on the right track all along, and they warn that the state could face lawsuits if it imposes standards that are too strict. “Developing the right approach to water-quality protection for Washington will thus require various interests continuing to work together to find common ground.